With their 15th season set to kick off May 24 against the Quebec Dynamo, the Ottawa Fury FC Women’s squad announced its first five signings as Head Coach Dom Oliveri has added five internationally-capped Canadians to his roster for the upcoming W-League campaign. Returning to the club from last season is defender Shelina Zadorsky who will be joined by fellow Canadians Christabel Oduro, Bryanna McCarthy, Ashley Lawrence and Kadeisha Buchanan (pictured) who recently starred in Canada’s 1-1 draw with the United States on May 8. Returning from last year’s squad is former Michigan University defender Shelina Zadorsky. The 21 year-old Zadorsky picked up her first international cap for Canada in January of last year against South Korea, and was named to the Big Ten’s All-Conference team after consistent standout performances during her senior year in 2013. “We’re very happy to have Shelina back- she played significant minutes for us in 2013, and we’re extremely happy to have her anchor our defense for another year,” says Fury manager Dom Oliveri. Zadorsky was an everyday defender for Oliveri in 2013 logging the fifth most minutes on the team. Oliveri has bolstered the Fury FC Women’s offense immensely with the signings of forward Christabel Oduro and defender Bryanna McCarthy. 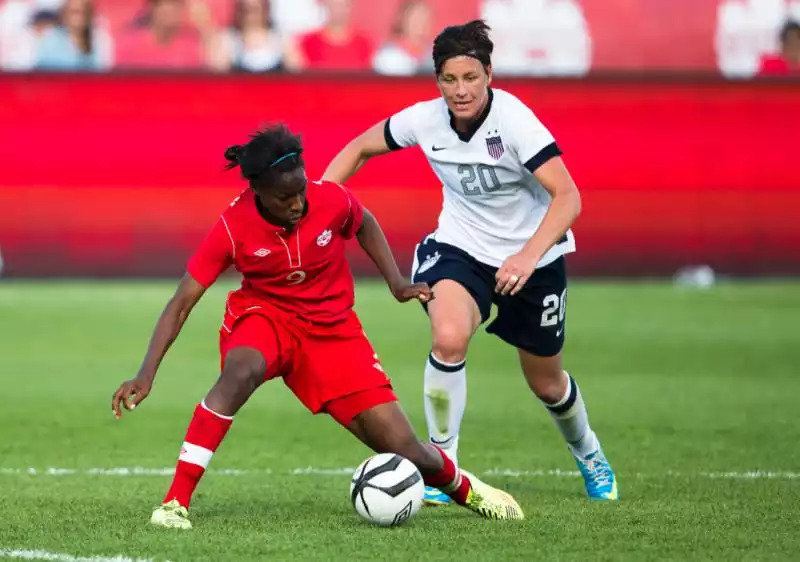 Oduro, a native of Brampton, Ontario, has featured many times for various Canadian national youth squads and has five caps to her name with the Canadian senior women’s national team. Standing just 5’3, the speedy forward excelled throughout her collegiate career at the University of Memphis, capping it with an All-Conference selection in her 2013 senior season. McCarthy, a native of Ajax, Ontario, was a defensive stalwart in her collegiate career with the West Virginia Mountaineers. During her junior year in 2011, McCarthy busted the myth that defenders can’t help out offensively, as she led West Virginia with nine assists. The versatile McCarthy spent time last season with the NWSL’s New York Flash. Head coach Oliveri says, “Christabel and Bryanna are both players we’ve been trying to bring to Ottawa for a number of years. Both possess tremendous pace and attacking abilities; we will definitely look to them to contribute offensively.” Both Oduro and McCarthy bring significant W-League experience to Ottawa – a squad that will have no shortage of depth or experience in 2014. Continuing with the West Virginia theme, the Fury FC Women will have two current Mountaineers, Ashley Lawrence and Kadeisha Buchanan, with the club this summer in addition to WVU alumna Bryanna McCarthy. Lawrence, a midfielder from Toronto, Ontario, tied for a very respectable fourth in Mountaineers scoring during her freshman year in 2013. Lawrence has also made seven appearances as a substitute for the senior women’s national team, bringing value international experience to Dom Oliveri’s squad. Buchanan, arguably the most high-profile signing of all, is a defender who has already appeared an astonishing fourteen times for the senior women’s national team at the young age of 18. The Mountaineer centre back started every match of her freshman season for West Virginia in 2013, capturing a Big-12 conference championship in the process. Buchanan has featured regularly in Canadian national team manager John Herdman’s starting XI since first-choice centre back Lauren Sesselman went down with an injury. She has taken the opportunity and run with it, producing excellent defensive performances for Herdman’s national side against the likes of Abby Wambach and the United States. Buchanan’s experience against the world’s best on the international stage will help bolster an already superlative Fury defensive core. With plenty of NCAA and international experience, Oliveri will be hoping that these footballers will help the Fury FC Women’s team bounce back this season after a heart-breaking defeat on penalties in last year’s W-League Central Conference Final against the Laval Comets. Note: Remaining 4 home games (June 28, July 5, 6 and 12) will be played at Algonquin College.